Silicon Valley�s innovative arts collaborations and organizational structures�offshoots, spin-offs, and startups�were founded by unsung heroes who resisted the establishment. 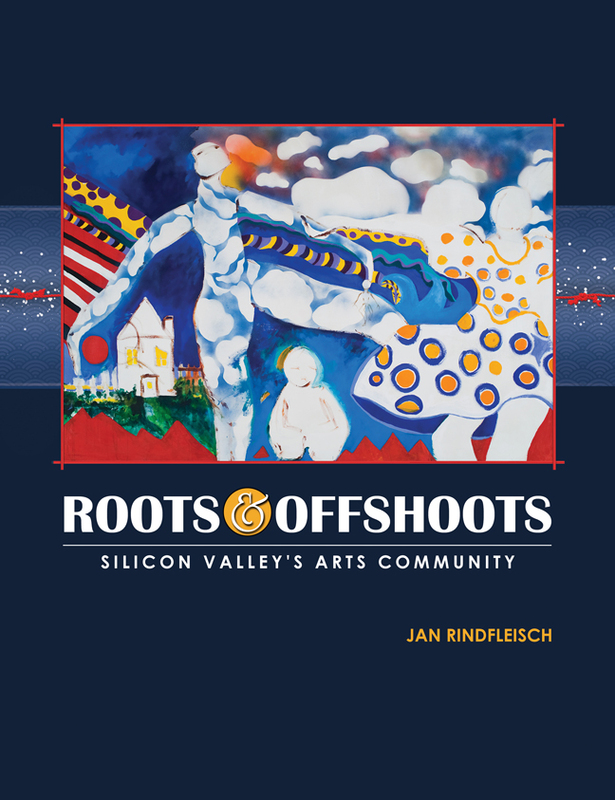 Roots and Offshoots: Silicon Valley�s Arts Community explores that ignored history, offering a behind-the-scenes look at the development of arts and culture in the South Bay Area. Tracing connections between the influential work of historical figures like the ancestral Ohlone, Juana Briones, Marjorie Eaton, and their modern-day equivalents, Roots and Offshoots� profiles of passionate individuals, creative partnerships, and maverick arts institutions offer insights into the art of community building. For updates and to purchase a book, visit www.gingerpressbooks.com. Distributed by Bolerium Books, San Francisco. Heartwork: Creating Something Together, 1996. Offers a glimpse of people and organizations working locally and internationally, particularly collaborations related to shared, deeply felt experiences. Interdisciplinary, intercultural, combining fun and fervor, this project nurtures hope for art forms that draw individuals and communities together in new ways. Collaboration with Slobodan Dan Paich. Collaborating organizations included Artship Foundation, Augustino Dance Theater, and Indian Canyon Ranch/Costanoan Indian Research, Inc. Produced and edited by Jan Rindfleisch. Contributors include: Slobodan Dan Paich, Augusto Ferriols, Oden Santiago, Mark Beaver, Norine Nishimura, Anne-Marie Sayers, Russell Imrie, and Gerri Parker. 15 pages, 17 illustrations. 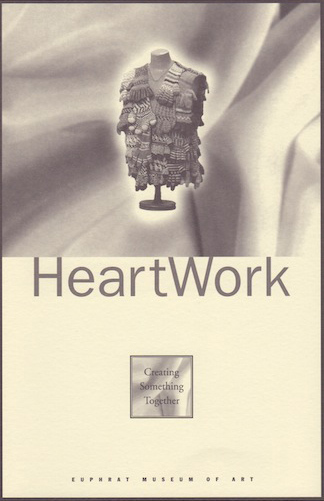 Published in conjunction with the exhibition: Heartwork: Creating Something Together, Euphrat Museum of Art, 2/6-4/17/96. 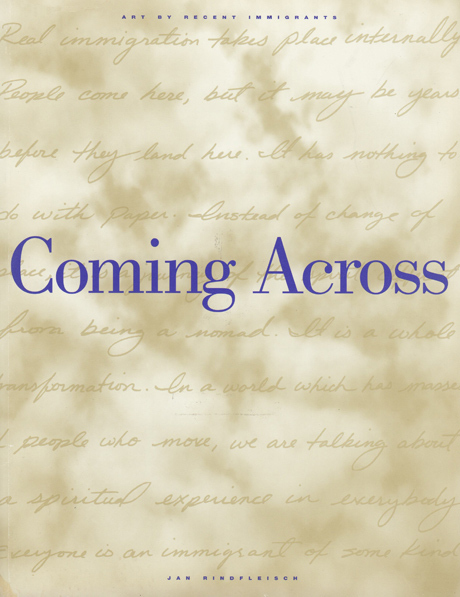 Coming Across: Art by Recent Immigrants, 1994. Wide variety of works by San Francisco Bay Area visual artists who have immigrated to the United States since 1980. Features artists from Argentina, Cambodia, El Salvador, Ethiopia, Hong Kong, Iran, Korea, Mexico, Nigeria, the Philippines, Poland, the former USSR, Taiwan, Turkey, and Vietnam. Includes extensive interviews and commentaries on the concept of immigration as representative of the common human experiences of continual and rapid change, shifting identities, and loss of secure place called home. Coming Across speaks of a U.S. culture constantly challenged and renewed, in part through the richly varied influence of artists who are immigrants. Produced and edited by Jan Rindfleisch. Project development by Jan Rindfleisch with Patricia Albers and Judy Goddess. Included collaboration with the Bronx Museum of the Arts and Betti-Sue Hertz, with funding from the Rockefeller Foundation and the NEA. Introductory essay "Coming Across: Art by Recent Immigrants," Jan Rindfleisch. Commentaries: Mark Ong, Vishwas More, Seán O'Riordan, José Antonio Burciaga, Salwa Mikdadi Nashashibi, Andrew Lam, Van Anna Duong. Project Coordinators: Diana Argabrite, Kim Sanzo, Laura Yasuda. 65 pages, 31 illustrations, perfect bound. Published in conjunction with the two-part exhibition: Coming Across: Art by Recent Immigrants, Euphrat Museum of Art, 2/3-4/20/94, 9/27-12/8/94. ISBN 1-886215-00-6. 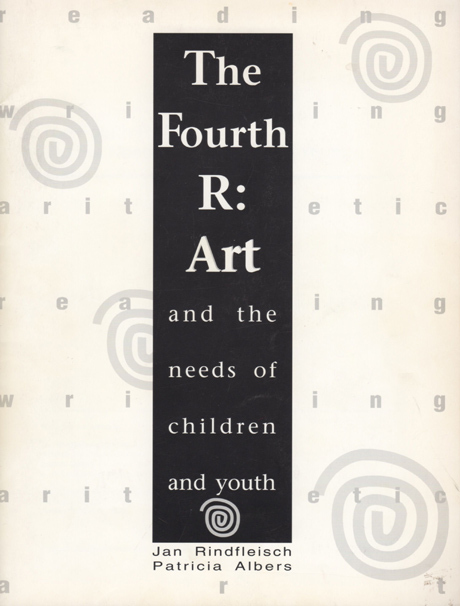 The Fourth R: Art and the Needs of Children and Youth, 1992. After decades of the three Rs cliché (reading, writing, arithmetic), what about art, the fourth R? Articles include art-world artists, art passed from parent to child, art made by children and youth at times of crisis, art produced in community collaborations. Selected art programs are featured, during school hours and out in the community. Produced and edited by Jan Rindfleisch and Patricia Albers. Introductory essay "The Fourth R: Art and the Needs of Children and Youth," Jan Rindfleisch. Commentaries: Lorraine Serena, Ruth Asawa, Sofia Mendoza, Marilyn Krysl, Eliot W. Eisner, Charlene Williams, José Antonio Burciaga. Contributors include: Willie Birch, Shooting Back, Inc., Peter Carpou, Ann Y. Sheridan, Susan Cervantes, and Jane Ash Poitras. 50 pages, 24 illustrations. Published in conjunction with the two-part exhibition: The Fourth R: Art and the Needs of Children and Youth, Euphrat Gallery, 1/7-4/23/92. The Fourth R: Art looks at some of the artists and art programs that address the needs of children and youth. The Fourth R books and archival documents, including an eight-page publication on local unsung heroes in art education, have been sold or distributed to donors, council members, commissioners, child advocates, other government/education/community leaders, and the press. The books have been requested by arts and education leaders. Drawing from Experience: Artists over Fifty, 1990. This book presents years of life experiences, bringing together artists of different backgrounds and attitudes. Articles provide information about the art, the artists, progressions in their work, and when possible, relationships to larger issues on aging. Offers an intimate look into the circumstances and challenges these artists have faced and at the variety of artistic responses. Honors changes that occur in artists' work as they age. The artists brought different cultural and geographic perspectives from their studios across the United States and Mexico. Produced and edited by Jan Rindfleisch with Patricia Albers. Consultants: Patricia Albers, Judy Goddess, Lucy Cain Sargeant. Introductory essay "Drawing from Experience," Jan Rindfleisch. Commentaries include Robert Rice, Eloise Picard Smith, Gwen Yao, and Charlotte Suskind. Contributors to the book include Patricia Albers, Jose Antonio Burciaga, Beth Coffelt, Andy Grundberg, Addie Lanier, Lucy Lippard, Dorothy Mayers, Karen Nuñez, Andree Marechal-Workman, and Jan Rindfleisch. 40 pages, 22 illustrations. 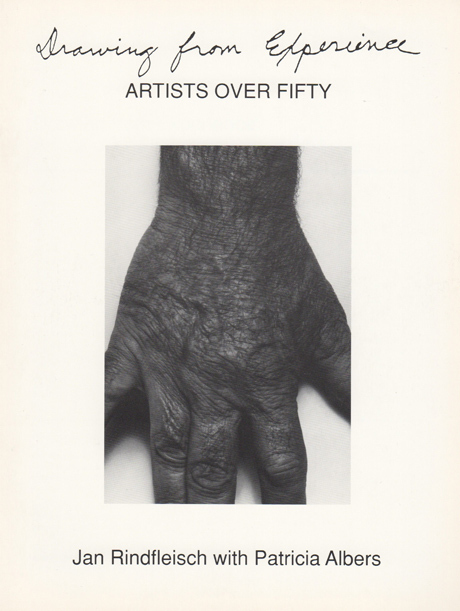 Published in conjunction with the exhibition: Drawing from Experience: Artists over Fifty, Euphrat Gallery, 1/2-2/22/90. Art of the Refugee Experience, 1988. Articles on art by and about refugees from Southeast Asia, Central America, Eastern Europe, Africa, and elsewhere around the world, providing insight into the human story of expulsion: tales of the old country, the journey, the new country. While the refugee experience is often harrowing, it is an integral inescapable part of the life of many highly creative artists. Niwat Pao-in, untitled color photograph taken in refugee camp Phanat Nikhom in Thailand. Back cover: Art of the Refugee Experience, 1988. Produced and edited by Jan Rindfleisch. Collaboration with Eve De Bona, Director, Helias Foundation for Art and Human Rights, and with United Nations High Commission for Refugees and the United States Committee for Refugees. Consultants: Laurel Herbenar Bossen, Judy Goddess, Lucy Cain Sargeant, Alison Wells. Introductory essays "Art of the Refugee Experience," Jan Rindfleisch, and "When Elephants Fight," Eve De Bona. Commentaries: Terry Kratovil, Roger P. Winter, Peter Selz, Whitney Chadwick, Marcia Chamberlain, Luis Jimenez, Florence Wong, Marcia E. Fong. Contributors include: Eve De Bona, David Henderson, Catalina Parra, Shifra Goldman, Denis Collins, Judy Goddess, Victor Valle, Madeline Janis, Michael LaVigne, Assefa Adefris, Tam Nguyen, Roger Harmon, Stephen Salmon, Linda Smith, Salwa Nashashibi, Robert Darr, Barbara Harrell-Bond, Janet Spritzler Levin, Milton N. Estes, Thomas Steel, David Gilbert, and Linda McKinney. 56 pages, 35 illustrations, 3 maps. 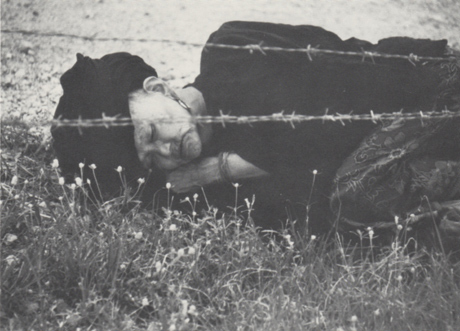 Published in conjunction with the exhibition: Art of the Refugee Experience, Euphrat Gallery, 1/26-3/24/88. The book Art of the Refugee Experience presents art and writings emanating from the wide range of refugee experience, yet points to common emotions and circumstances shared when people are forced to function in an unknown culture. The book illustrates conflicting, ambivalent viewpoints about the old country and the new country. Some artworks condemn the horror left behind; others idealize that image called home, build on centuries-old traditions, explore art world frontiers, or create a world of serenity and beauty. Copies of Art of the Refugee Experience were requested by the Afghan Cultural Assistance Foundation for use in San Diego's Soviet Arts Festival. An additional thirty copies of Art of the Refugee Experience were requested by the refugee camp Phanat Nikhom, in Thailand, where it was used in special classes for refugees. The Power of Cloth: Political Quilts 1845-1986, 1987. Jane Benson and Nancy Olsen with Jan Rindfleisch. Points to the power of quilting as an art medium for political expression, and addresses the history and nature of the current renaissance in political quilt making. Produced and edited by Jan Rindfleisch. Introductory essays "The Power of Cloth," Jan Rindfleisch, and "The Power of Quilts: An Introduction," Jane Benson, Nancy Olsen. Contributions from Libby Westie, Stewart Burns, Ricky Clark, Judy Goddess, Laurel Herbenar Bossen. Consultant: Lucy Cain Sargeant. 63 pages, 22 color illustrations. 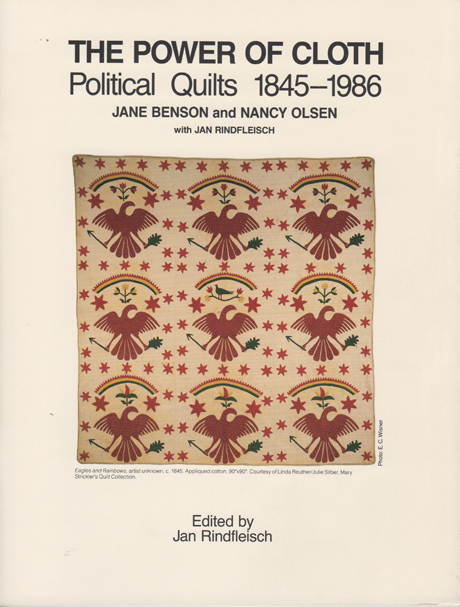 Published in conjunction with the exhibition: The Power of Cloth: Political Quilts, 1845-1986, 3/3-4/19/87. 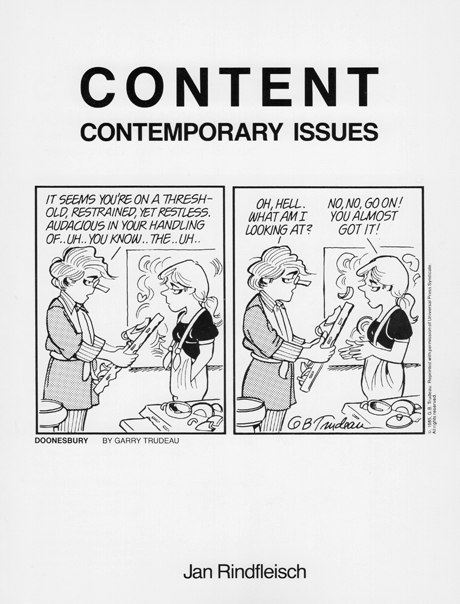 Content Art: Contemporary Issues, 1986. Includes issue-oriented art and writings by artists, commentaries by people with strong points of view, criticism, information and questions, and the story of a project that included two exhibitions as well as the book. Articles relate individual experiences regarding "making a point" and "spelling it out " in art. Produced and edited by Jan Rindfleisch. Consultants: Dr. Judy Goddess, Lucy Cain Sargeant, Lenda Anders Barth. Introductory essay "Content: Contemporary Issues," Jan Rindfleisch. Commentaries: Lenda Anders Barth, Michael S. Bell, Margy Boyd, Bill Honig, Ana Huidobro, Ruth Yoshiko Okimoto, Annie Reis, Moira Roth. Contributors include: Michael S. Bell, Douglas Holmes, Dennis Heekin, Lee Roy Champagne, Frances Butler, Harriete Estel Berman, Sharon Wood, Gloria Rose Ott, Juana Alicia, Keith Sklar, Laurie Marks with C. E. Santiago, Judy Goddess, Sharon Wood, Eleanor Dickenson, Joe Sam., Ann Einstein, Lenda Anders Barth, Barron Storey, Marie Thibeault, Al Farrow, Eve De Bona, Audrey Keller, and Gen Guracar. 64 pages, 41 illustrations. Published in conjunction with two exhibitions: Content Art: Contemporary Issues, Southern Exposure Gallery, San Francisco, 10/19-11/16/85, and Content: Contemporary Issues… Points and messages… Making a point… spelling it out… and talking about it!, Euphrat Gallery, 1/7-2/20/86. Art Collectors In and Around Silicon Valley, 1985. Articles follow collectors from the first stages of personal acquisition to the later stages of public participation and exhibitions. The collectors provide essential first-hand information for understanding the diverse directions, motivations, and values inherent in collecting. The articles identify resources for collectors and would-be collectors. Produced and edited by Jan Rindfleisch. Consultants: Judy Goddess, Lucy Cain Sargeant. Introductory essay "Art Collectors In And Around Silicon Valley," Jan Rindfleisch. Commentaries: Michael S. Bell, Georgianna M. Lagoria, Keiko Mizushima Keyes, Edna and Farley Young, John Stewart, Paula Z. Kirkeby, Dede Evans, Ronnie Goldfield, Mildred Howard, Cordell Koland, Robert Flynn Johnson, Consuelo Santos Killins, Senator Alfred E. Alquist. Contributors include: Benjamin Eisenstat, M. Lee Stone, M.D., Shirley Ross Davis, Jeanne Abbott, Betty Hill, Carol Little, Amy McKittrick, Phyllis Willits, Rosemary Young, Paul M. Cook, Donald B. Goodall, Albert A. Eisenstat, Mort Levine, Anonymous, Jay Pidto, Dr. and Mrs. Richard R. Dewey, Joseph Zirker, Michael Rossman, Irving Fromer, The Hon. Henry Ramsey, Jr., Wallace Stegner, Dorothy Varian, Claude A. Look, Marion Patterson, Chuck Henningsen, Marie Johnson-Calloway, Paul Pratchenko, Philip L. and Susan Hammer, Alexander H. Ellenberg, M.D., F.A.C.S., Jan MacDonald, Meryle Karloff Holmes, Stephen R. Stern, Alan Leventhal. 57 pages, 34 illustrations. 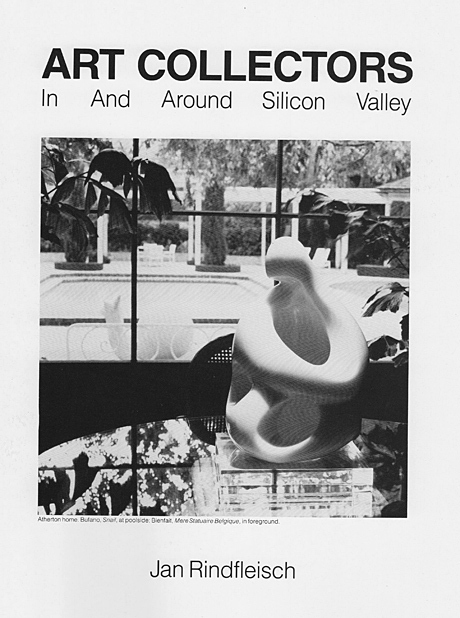 Published in conjunction with the exhibition: Art Collectors In And Around Silicon Valley, Euphrat Gallery, 2/19-4/18/85. Presents viewpoints, issues, art, and artists, all relating to the subject of "faces," and addresses questions such as: When do faces in art affect people, instruct people? Consider a commissioned portrait of an executive, an un-commissioned portrait of an artist, a political caricature, a documentary photograph, a face from a public mural, a face drawn using computers and artificial intelligence, and a mother's face drawn by her child. Produced and edited by Jan Rindfleisch. Collaboration with Lucy Cain Sargeant. Introductory essay "Faces," Jan Rindfleisch. Commentaries: Charles Shere, LaDoris Hazzard Cordell, Charles Miedzinski, Carmen Lomas Garza, Kristina Hooper, Carlene Young, Harry Mittelman, M.D., David A. Heagerty, Brian K. Grayson, Fred Martin, Betsy Fryberger, Michael Bell, John Vasconcellos. Contributors include: Phyllis Butler, MaryEllen Ray, Beth Coffelt, Patrick Findley, Caroline Drewes, Judy North, Beverly Mayeri, Betty Bentley, Richard Bermack, Jean La Marr, Daniel Galvez, Keith Sklar, Ron Kilgore, Susan Siminger, Marie Franklin, Ruth Yoshiko Okimoto, James Paul, Signe Wilkinson, Susan Brennan, Karen Sjoholm. 48 pages, 37 illustrations. 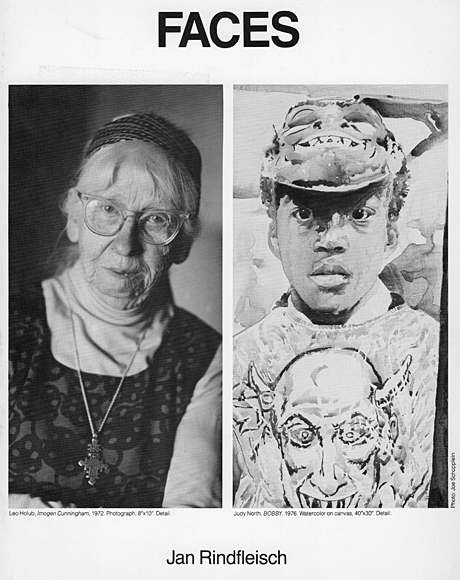 Published in conjunction with the exhibition: Faces, Euphrat Gallery, 2/7-4/27/84. Cover: Leo Holub, Imogen Cunningham, 1972. Photograph, 8"xl0". Judy North, Bobby, 1976. Watercolor on canvas, 40"x30". Investigates the art of many religious and spiritual groups today, concentrating on art produced, collected, or displayed in the greater San Francisco Bay Area. Cover art: Peretz Wolf-Prusan, Ancient Religious Symbols. Crescent, earth mother, pilgrimage of the soul, menorah, Vesta, Russian-style cross. Left to right, top to bottom. Produced and edited by Jan Rindfleisch. Collaboration with Lucy Cain Sargeant. 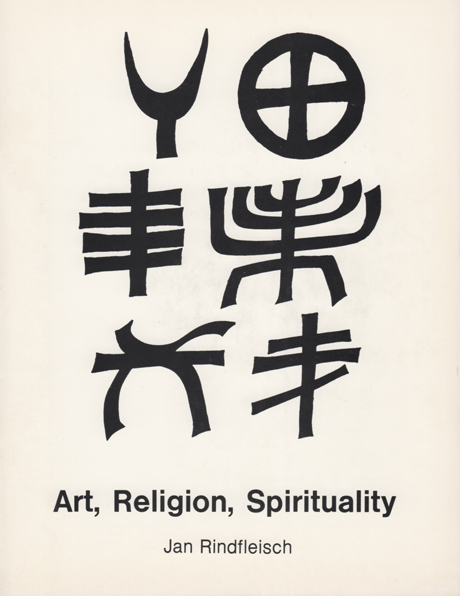 Introductory essay "Art, Religion, Spirituality," Jan Rindfleisch. Commentaries: Jo Milgram, Michael S. Bell, Richard E. Keedy, James M. Freeman, John Hunter, Thomas A. Drain, Charles Shere, Fred Martin. Contributors include: Maryann Reese, Ken Reese, John Hunter, W. Warner Beckett, Johanna Domela Movassat, Reverend Hiroshi Abiko, Jean Shinoda Bolen, Sonja Margulies, Margaret Harvey, Mabel McKay and friend, Carol Holzgrafe, Peretz Wolf-Prusan, Judith Bettelheim, Carmen Lomas Garza, Helen Colijn, Royce Vaughn, Roger Hogan, The Rev. Jerry Wm. Drino, Rev. Alan Arnone, Betty Baughman, Thomas A. Drain. Helen Burke, Carol Holzgrafe, Gerald Eknoian, Nguyen Huu, David Latimer. 47 pages, 29 illustrations. Published in conjunction with the exhibition: Art, Religion, Spirituality, 9/21-11/4/82. Staying Visible, The Importance of Archives, 1981. How archives can be used by artists to help ensure their future visibility, and sets forth issues in the "making of art history." Eleven researchers, including artists, art historians, mentors and admirers, examine the lives of individual artists-with a focus on putting this material into archives. Produced and edited by Jan Rindfleisch. Collaboration with Lucy Cain Sargeant. Foreword: Paul J. Karlstrom, West Coast Area Director, Archives of American Art, Smithsonian Institution. 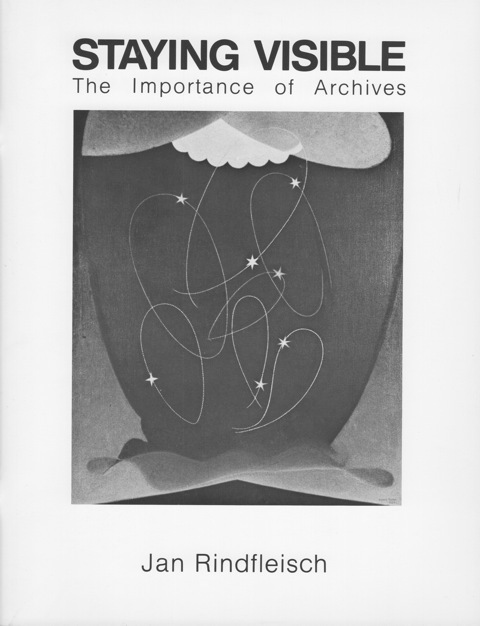 Essay "The Importance of Archives," Jan Rindfleisch. Commentaries: Wanda M. Corn, Associate Professor of Art History, Stanford University; Marie Pinedo, Education and Resource Director, Galeria de la Raza; Charles Shere, music and art critic, Oakland Tribune; Mary Stofflet, art journalist-Artweek, Artforum, and Images and Issues; Tom Albright, critic, San Francisco Chronicle; Karen Petersen, co-author of Women Artists; Recognition and Reappraisal; Jan Butterfield, Associate Editor of Images and Issues; Michael Bell, museologist. Contributors include: Margaret Stainer, Kim Bielejec Sanzo, Betty Estersohn, Deanna Bartels, Carol Holzgrafe, Judith Bettelheim, Lucy Cain Sargeant, Jim Rosen, Katherine Huffaker, Ellen Linnea Dipprey, Suzaan Boettger, Ellen Linnea Dipprey. 48 pages, 24 illustrations. Published in conjunction with the exhibition: Staying Visible, The Importance of Archives, 9/22-10/23/81. The book Staying Visible is the basis for the Staying Visible exhibition and culminates a two-year research project about archives. A probing essay, "The Importance of Archives," describes the project and discusses the value of "saving stuff." It points up how knowledge about archives can be used by artists to help ensure their future visibility, and sets forth issues in the "making of art history." Eleven subsequent articles (some intimately revealing, some critical/historical) involve research into the lives of individual artists. Flo Oy Wong, Honoring, 1998. Jan Rindfleisch. 4 pages, 3 illustrations. 11x8.5". In conjunction with exhibition at the Sunnyvale Creative Arts Center Gallery, 10/29-12/12/98, dedicated to the memory of Bernice Bing. The exhibition and writing were a way to honor Wong, who received the 1997 Media/New Genre Award from the Santa Clara County Arts Council for the quality of her work and professional achievements. Her art has touched many people and she has worked collaboratively to address major cultural, historical, and political issues of the day. Amelia Kroll Solomon, A Walk Through a Lifetime of Dreams, 1998. Terri Cohn with Amelia Kroll Solomon. 4 pages, 4 illustrations, 11x8.5". In conjunction with exhibition 11/2-11/25/98, at the California History Center, curated by Jan Rindfleisch, Euphrat Museum of Art. Concurrently Solomon was also one of the artists in the Euphrat exhibition Art and Education 11/18/98-1/21/99. Solomon, born early in the 20th century in czarist Russia, challenged us through etching, lithography, cast paper, and bronze, e.g. Out of the Ashes, 1995-97, bronze, 84"x21"x18". 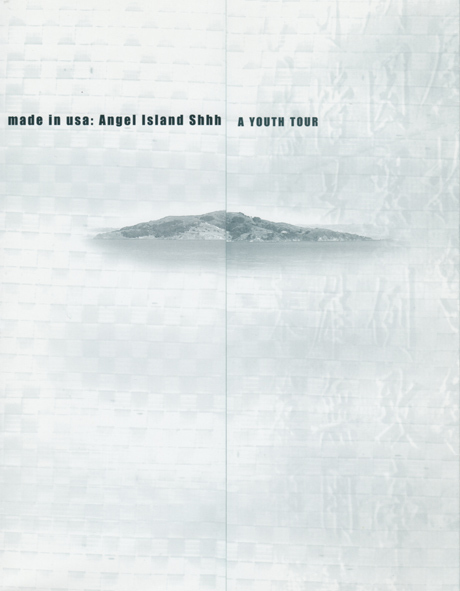 made in usa: Angel Island Shhh - A Youth Tour, 2001. Accompanying the exhibition 2/22-4/19/01. History of Angel Island and related artwork by Flo Oy Wong, accompanied by suggested activities. Publication developed by Jan Rindfleisch with Kearny Street Workshop in San Francisco. Essay written by William Wong and activities developed by Diana Argabrite. Distribution by Euphrat Museum of Art, Kearny Street Workshop, Evergreen College. Collaboration: Juana Alicia and Matt Schwarzman with Jan Rindfleisch, in conjunction with the Euphrat exhibition, 10/12-11/10/95. Curatorial lead: The Institute for Urban Arts. Features the work of four interdisciplinary arts programs based in communities of the greater San Francisco Bay Area. Participating organizations include Berkeley-Oakland Support Services; Community Arts Apprenticeship Program, Oakland; East Oakland Youth Development Center; East Oakland Boxing Association; Ethnic Trip, San Francisco; Electric Mercado, Santa Cruz; San Francisco Digital Media Center (D* Lab); White Hawk/Xuicoatl Arts, Watsonville. 6 pages, 6 illustrations. Two versions of booklet, one designed by Alliance Graphics, the other by Michael Lee. Expanded 8-page announcement for the exhibition. Interviews of the artists. Expanded (6-page) announcement for the exhibition. Quotes about art and tourism. Mini-catalog, which accompanied the exhibition, calls attention to the vitality and professionalism of the art community locally and highlights a wide range of artworks. 8 pages, 15 illustrations. 8-page exhibition booklet, which accompanied the exhibition. Produced and edited by Jan Rindfleisch, in conjunction with a Euphrat exhibition, 1/18-3/3/83. Works from the San Francisco Bay Area, internationally renowned for its commercial art. One of the sections is by Signe Wilkinson, the first woman with a Pulitzer Prize in cartooning, 1992. Collaboration with Lucy Cain Sargeant and Kim Bielejec Sanzo. Ideas and assistance from Judy Goddess and Jan Karlton. 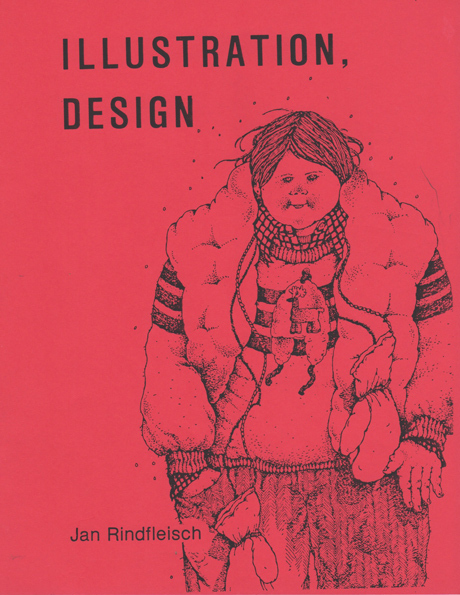 Introductory essay "Illustration, Design," Jan Rindfleisch. Contributors include: Lawrence V. Duke, Bunny Carter, Raul del Rio, Helen Webber, Sam Smidt, Stephen Osborn, Richard Leech, David Lance Goines, Caleb Whitbeck, Bud Schultz, George Pennewell, Scale Models Unlimited, Glenn Myles, Betsy A. Palay, Howard Brodie, Signe Wilkinson, Len Lahman, Sidney Fischer, Lincoln Cushing, Doug Minkler. 22 pages with line drawings. Cover art: Sidney Fischer, ink drawing for San Jose Mercury News, 12/21/82. 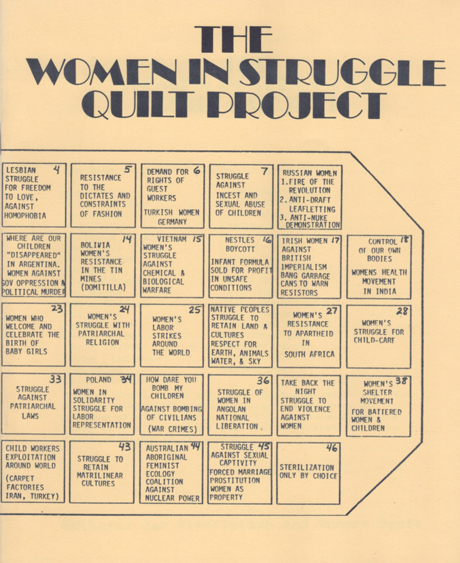 The Women in Struggle Quilt Project, 1983. Gen Pilgrim Guracar (Bulbul), Coordinator. Editors: Jan Rindfleisch and Robert Scott. In conjunction with the Euphrat exhibition ARTECH and Art by Hand, 4/26-6/5/83. 19 pages. Original printing in "dot matrix." Cover design: Gen Pilgrim Guracar's "map" of The Women in Struggle Quilt. Book addresses 16 of the 46 squares. Some of the artists are from countries other than the US. Book produced and designed by Jan Rindfleisch and Robert Scott. Art director Lucy Cain Sargeant. Art assistant Kim Bielejec Sanzo. Editorial assistants: Susan Enteen, Sarah Lennox, Carol Holzgrafe. © 1983 by Gen Pilgrim Guracar and Jan Rindfleisch. Additional contributors include: Vivian Andres, Jane Benson, Pat Berge, Terri Clark, Susan Enteen, Terri Esther, Jesse Gathering, Sally Golden, Sarah Lennox, Sabina Mayo-Smith, Ginny Puddefoot, Magdalena Rosales, Zoe Sofoulis, Barbara Turner. An eight-page publication on local unsung heroes in art education, circa 1992.